Social media has emerged as an unrivalled marketing tool for the businesses today. That’s why every brand strives to be social media savvy and the best way to do that is ‘Social media integration’. What exactly is social media integration? In the absence of social media integration, the marketing team would have to post the desired content on different platforms manually. It would be quite a difficult and time-killing process of managing all the accounts with different login credentials. However, with the help of social media integration, all these social media accounts can be organized in a much better way thus facilitating an easy sharing, publishing and scheduling of posts. Social media integration helps the customers to voice their opinions. It further ensures that real interactions relating to the respective brands take place on a wider level. This results in the creation of a credible social name among potential customers as well. 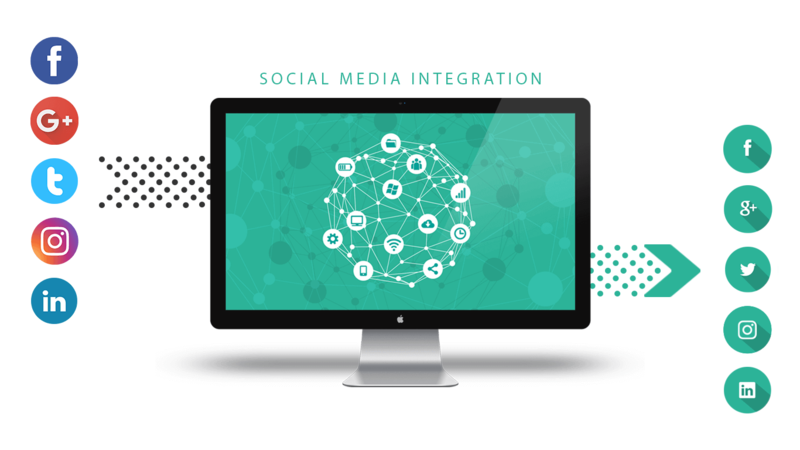 Social media integration not only helps organize social media posts but also the interactions that take place between a brand and its consumers. It enables you to receive notifications and interactions from each network all through a single channel. A business may have target audience in different time zones. In such cases, posting for the intended audience may be a tedious task. However, social media integration can help combat this issue with its scheduling feature. The feature allows you to stay ahead in time and schedule all the posts beforehand as per convenience. As a matter of fact, you can gather valuable, comprehensive customer data with the help of social media integration. The data may relate to customer locations, loyalty, interests and so on. This data can help predict the customer’s buying decisions and plan the next marketing campaigns accordingly. You can also leverage all these benefits, provided you employ the strongest integration of today’s era!